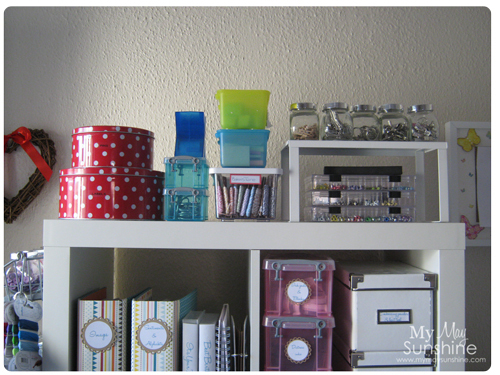 Over the last five weeks I have been showing you different ways that I organise things in my craft room. 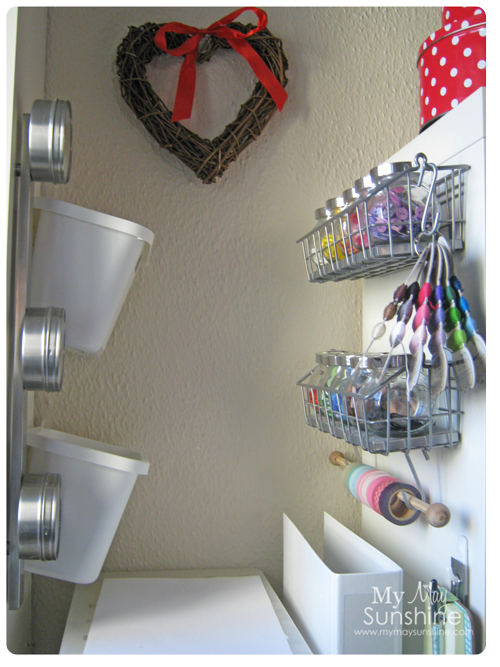 Today I am going to show my actual craft room. It measures 8 feet wide by 7 feet deep and is supposed to be my dining room but I prefer the dining table to be on the laminate rather than the carpet so took over the space for my craft room. For the shelves, I have three small expedit cubes that I have just put one on top of the others but placed in the middle of the two. This is the left hand side of the room. 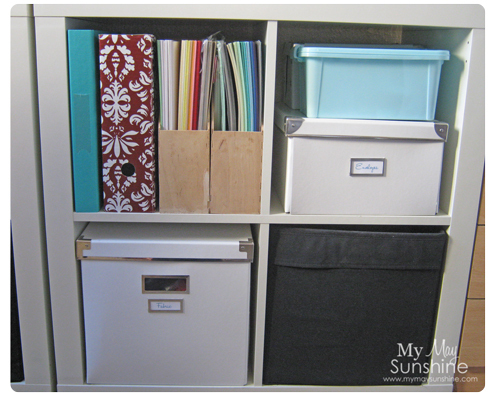 The top of the tall cupboard has a lot of binders and some Ikea magazine folders to hold things like paper for the printer and plastic pockets. The box at the top is the extra craft things for my daughter and the two plastic drawers hold paper for my daughter to draw. 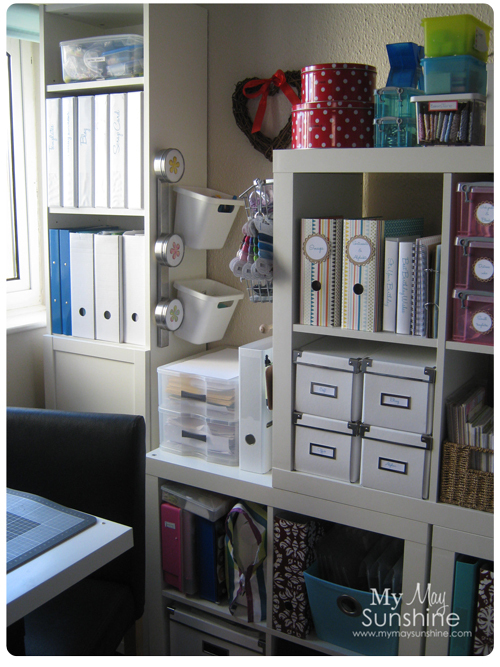 The wall shelves hold things like notebooks, cuttlebug and embossing folders, tub of twine, box of flowers and my desk organiser, which isn’t on my desk! I like to keep my desk quite clear unless I have lots of paperwork on it but don’t like to keep it messy for too long or it tends to get messed up courtesy of my daughter. 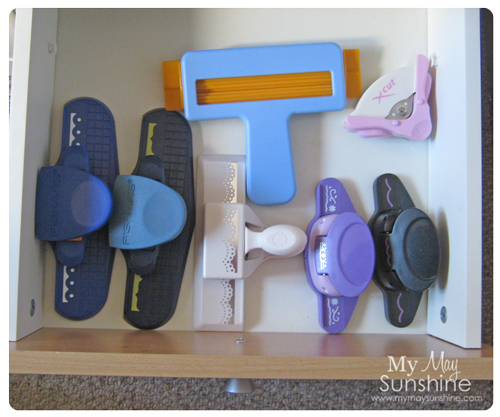 I keep most of my pens and office supplies I use regularly in the drawers below the desk. The desk is Ikea Vika Amon and the chair is Ikea Snille chair. This is my craft desk. 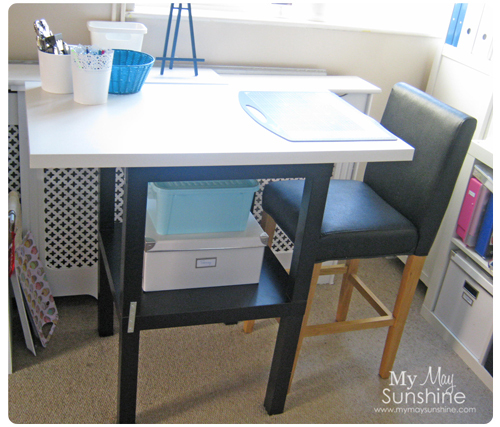 It is made from 2 black Ikea lack tables, one on top of the other, and a Ikea Vika Amon table top on the top of them which has been secured with brackets. I already had these items in my home, even the brackets and the chair use to be in my kitchen but was never used and so it was great to be able to use them for something I knew I would use. This is what is on the top expedit cube. 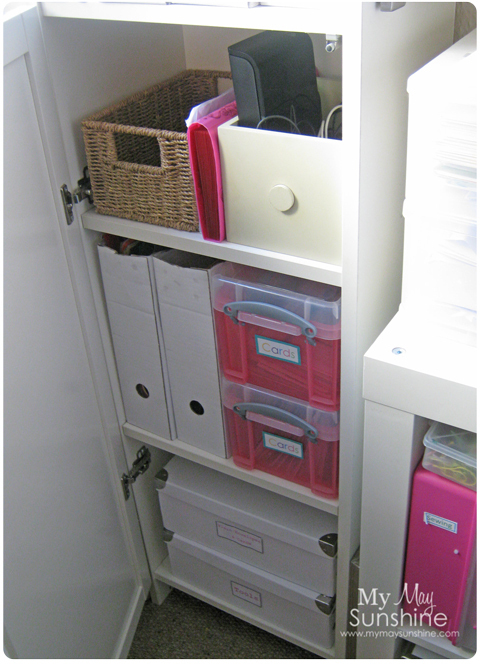 When I showed the brad and eyelet boxes, they were on the shelf below, but I moved them and the Ikea Rationell Variera shelf up to the top to allow me to use the shelf below for the boxes. The red spot tins have labels in the bottom tin and pins in the top tin. The Ikea Krus container has bakers twine which I posted about here. The top left has stamps which I explained more about here and dies which I showed the binder here. 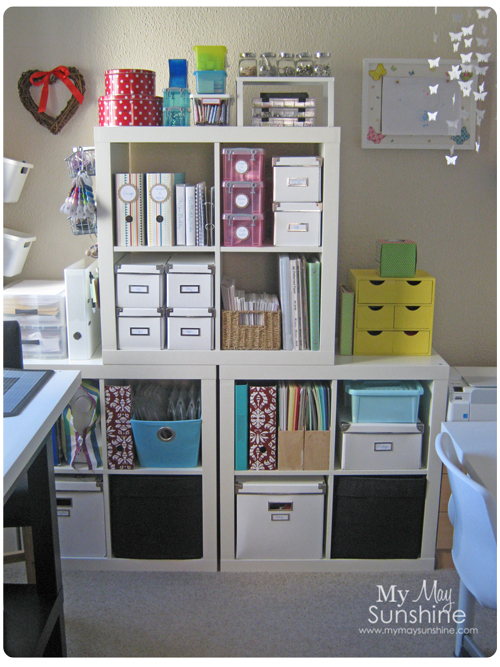 The top right has inks, embossing powders and heat tool and box of gifts. The bottom left has craft and office supplies and alphas and bling. 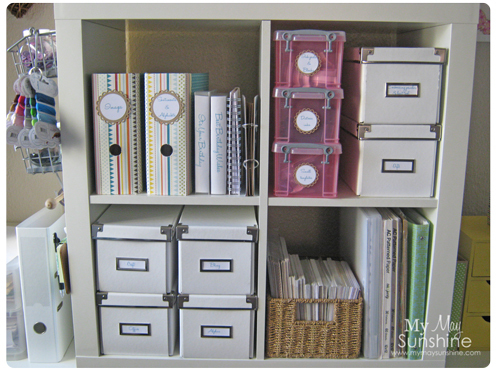 The bottom right has 6×6 paper pads and 12 x12 paper pads. The top left has my sewing machine, threads and sewing kit. 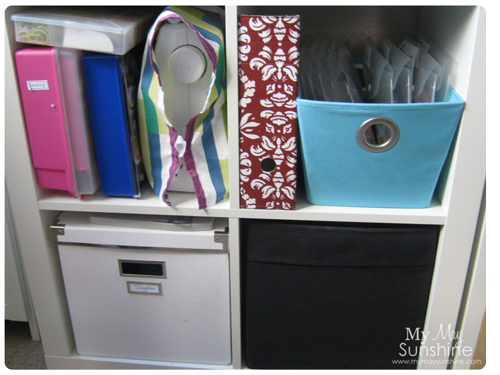 The top right has my ribbons which I explained how I store them here. The bottom left has extra supplies and the bottom right has random things in it. The top left has card and the top right has envelopes and extra adhesive. The bottom left has fabric and the bottom right has more random things. has things like glue gun and sticks. This is where the buttons are on the side of the top expedit cube, I showed you them here. Opposite is some Ikea Rationell baskets. They just slide on and off the 2 screws which are in the side of the cupboard. 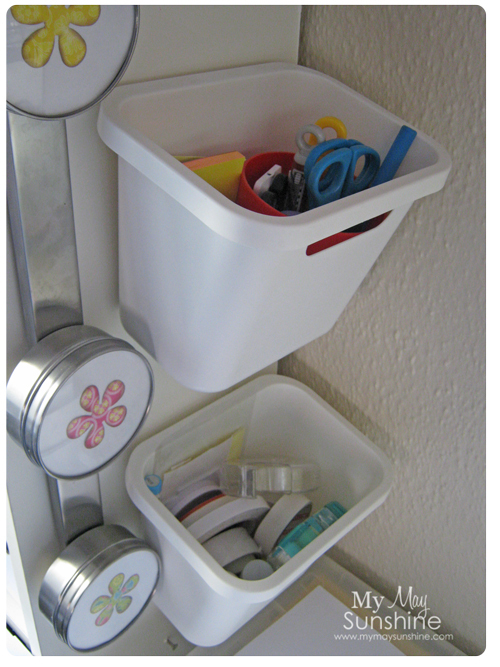 Next to them is an Ikea Grundtal magentic knife rack and the Ikea Grundtal containers which have paper clips in. In the top basket I store tools that I want to keep out of the way of my daughter and the bottom basket is full of adhesives. The small drawers with my printer on hold my punches. 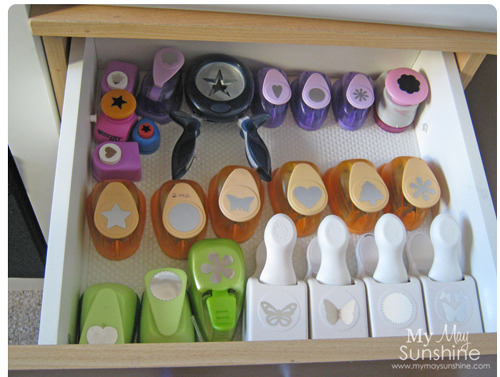 The top two drawers are lined with Ikea Rationell Variera drawer mat which stop the punches moving around. 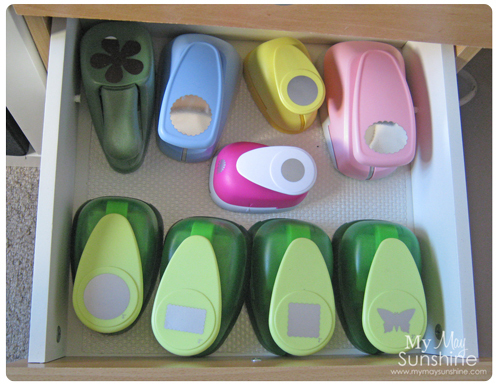 These are small punches in the top drawer. Larger punches in the middle drawer. Then the border punches are in the bottom drawer. 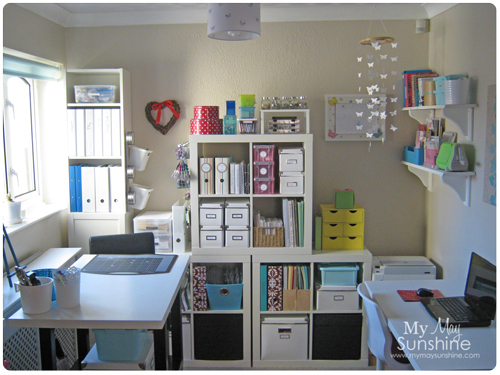 So that is my craft room and how I organise it. 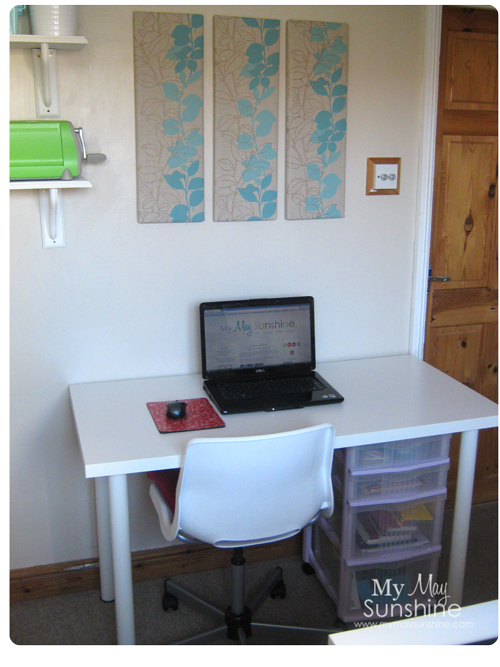 I came up with the craft table from an post on Ikea Hackers and how they had used two lack table as a kitchen bench and is great for sitting next to the window as the window is so high up and being able to look outside. I don’t really like to have the desk face the wall but it was the only way I could fit everything in. 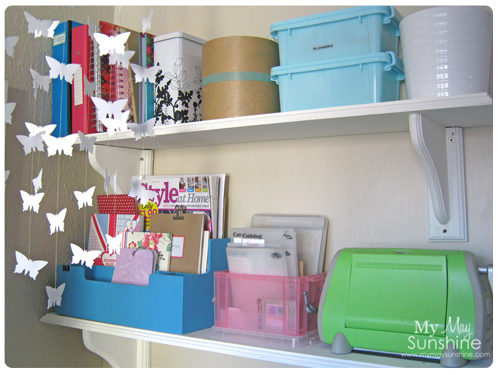 As my house isn’t that big, it is great to be able to have a small space for me and my crafts.